German Hunting Guns have long been recognized as being distinctive in styling, quality and construction. With the following pages I will try to illustrate these aspects. Click on the phrase or word in blue to go directly to that page. In Ammunition- Rifle and Ammunition-Shotgun will be found some basic information about the more commonly used metric ammunition. The page 14.5 x 49R and 14.5 x 52R Dombrowski-Heissig Hochwildpatrone tells the story of the little known rounds that were nearly identical to the already obsolete .577 Snider. A study of German Engraving will give the viewer an idea of the Art used to decorate the high grade guns and some of the Artists who did the engraving. Gun Components contains an overview of the subject by Dietrich Apel and includes links to the pages that cover the differant components. 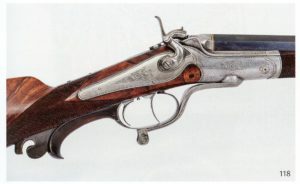 Gun Identification is an extensive look at Proof Marks, Trade Marks, and other marks on the guns which help to identify the Maker, where and when it was made. Gun Inventions and Patents will look at some of the more outstanding developments in German Hunting Guns. Gun Types looks at and explains the many differant basic types of the German Hunting Guns. Die Kipplaufbüsche is an article which explains and illustrates this popular type of rifle- the single shot break action rifle. Barrels explains the differant steels used in barrel construction and the Companies who made that steel. Ejectors is an article about a few of the many differant guns with often complicated Ejector Mechanisms which automatically removed a fired round from a guns chamber when the gun is opened. Sporting Long Gun Patents is a chronological list of the German Patents (DRP) for Sporting Long Guns and a link to the Search Page of the German Patent Web Site. Safeties looks at the history of and development of Safeties and how some of the more common ones function. Stocks is a look at how the German Long Gun Stock developed and evolved over the years and some of the distinctive features that make the guns both unique and practical in todays gun world.